NID Alumunus Comes Up With An Alternative To Plastic Carry Bags In 200 Milk Centres. 200 milk centres in Ahmedabad will replace plastic carry bags with eco-friendly jute bags developed by a student of National Institute of Design. From being a major polluter of marine litter, choking drains, causing heavy floods to be a cause of death for animals, polythenes, especially ones below 50 microns, is turning out to be more of a curse than a boon. Opting for eco-friendly alternatives is the need of the hour and 27-year old Shanvi Gupta, a resident of Jharkhand, has designed a bag which can replace plastic carry bags. As part of her graduation project, National Institute of Design (NID) student Shanvi decided to explore feasible options that could altogether replace huge volumes of plastic bags. I have always been concerned about the omnipresent plastic materials especially polythenes in all our lives. Being a design student, I wanted to design a bio-degradable and eco-friendly material and what better than bags, which is used by every age-group, gender and class. Considering the number of plastic carry bags people require at milk centres, Shanvi chose to start her project against plastic menace at the Amul milk centres. She conducted a 6-8 month extensive research on consumer behavior and type of requirements. The research was done in collaboration with jute industry under sponsorship from National Jute Board, Ministry of Textiles, Government of India and the dairy cooperative Amul. Shanvi would sit outside Amul parlours regularly. Before designing any product or material, it is necessary to study the pattern of consumers to cater to their feasibility. Since Amul has a wide customer base, I observed the people and how they carried their carry bags. If they travelled by a two-wheeler where they would hook their bags, the number of bags they would buy, what age group would generally buy the milk and so on, were things we kept in mind while designing the bag. To make the entire approach more interesting I gave a fashionable look to the bag that would easily attract the buyers, explains Shanvi. The design of the bag will cater to delivery boys and consumers who directly buy from the Amul parlours. Different bag variations have been developed by Shanvi which include potli, balloon bag, see-through and other such bags. As for its cost, since it is higher than the regular plastic bags, the milk company is in talks with National Jute Board to acquire the bags at subsidised rates. The Jute bag pilot project will be implemented in 200 milk centres across Ahmedabad. A total of 10,000 jute bags have been manufactured by the local vendors which will available in 15-20 days. 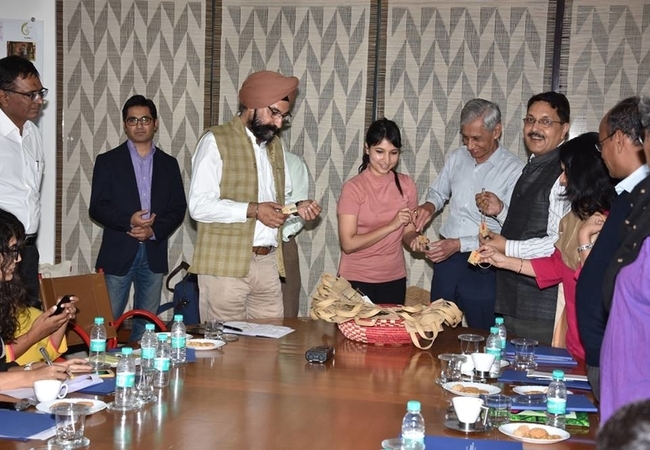 Five of these eco-friendly bags were launched on NID campus in presence of NID director Pradyumna Vyas, Gujarat Co-Operative Milk Marketing Federation managing director RS Sodhi, National Jute Board Secretary Arvind Kumar among others. Depending upon its success, the concept of Jute bags will be introduced in other parts of the state. Previous Post: Is CHUK Range The Solution To Plasticware? Next Post: Can Carry Bags Dissolve In Water And Burn Like Paper?